I'm making a minigame and there is a certain time thingo. How do I make a countdown appear in the chat/making a delay between /tellraw commands? Nope, It doesnt work. What are the command blocks set to? Are your command blocks actually set to be activated by a redstone signal? Also don't use chain or repeater command blocks if you are going to go the repeater way. So they are also set to conditional? and aren't set at unconditional right now? Could you put up an image of it? Wait so they have to be Uncoditional? They should be working fine then, is there no other redstone power being generated into it at all? also could you possibly show an image of it? Sorry for being late. This is a great way to add delays to command blocks, that I have been using for lots of maps and mini games. Sorry but how do you make it going into the block? I don't see a difference between our pictures. Thankyou! 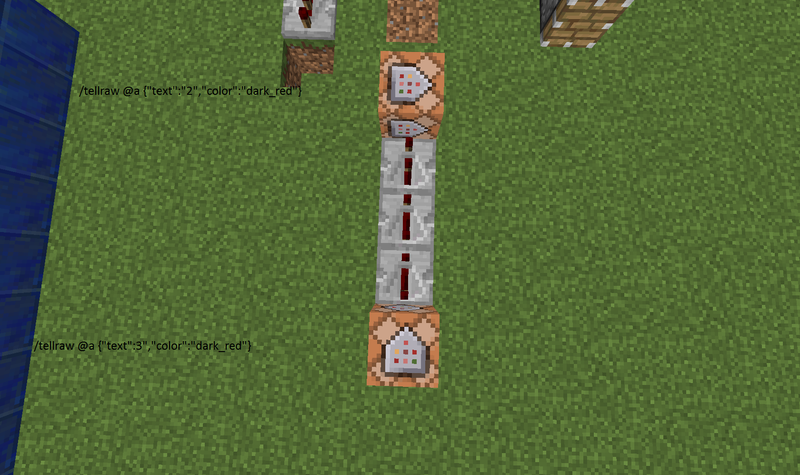 Place the redstone-block, torch, ANYTHING that outputs redstone on the blue wool and let a repeater run INTO the Command-block. EDIT: Yes I tested it out and it works... Thankyou so much!